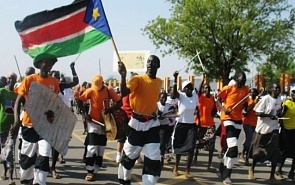 The Republic of South Sudan was proclaimed on July 9 following the referendum last January in which 98% of South Sudan’s residents voted for independence. ValdaiClub.com has interviewed Aydar Aganin, Editor-in-chief of the Russian news channel "Rusya Al-Yaum" (Russia Today in Arabic) . Do you think this will help Sudan and South Sudan to establish neighborly relations? Is a referendum on self-determination a cure-all for regional conflicts? I’m pessimistic about the future of relations between Sudan (in its new borders) and South Sudan. In theory, they can be good neighbors, but in both of countries and beyond there are too many forces willing to provoke an armed conflict between them. On the one hand, this is a tried-and-true method of uniting the population and consolidating power, which is very true of South Sudan and also applies to Sudan to a certain extent, although the latter is already waging a small war in Darfur. On the other hand, instability in this area will create a permanent pretext for outside interference in the affairs of both South Sudan and the Republic of Sudan. The presence of Sudanese President Omar Al-Bashir at the July 9 festivities in Juba is a good sign. The next few months will show whether the sides will preserve this level of relations. After the euphoric celebrations Juba will face quite a few problems. One of them is what to do with people of South Sudan that live in Sudan? On July 9 they became foreigners in the Republic of Sudan, deprived of all the rights of citizens. Many of them will return to South Sudan, either on their own free will or forcibly. It’s easy to imagine how this will affect South Sudan’s demographic, economic and social situation and its stability in general. As for self-determination referendums as a means of peacefully settling regional conflicts, it can play this role without a doubt. But the main task is not so much to organize the referendum as to guarantee a “peaceful divorce,” and this requires adequate agreements and the resolution of disputes. If there is no clear understanding on borders, for one, conflict is likely even if the referendum is a success. There is great confusion in Africa as a result of many inherited problems, primarily colonial-era borders. How is it possible to determine the status of oil-rich Abiey considering that in late May the Sudanese armed forces occupied this region in violation of UN resolutions? I think the northerners – the Republic of Sudan – won’t give it up of their own free will. They think they’ve already made many concessions to the southerners and it’s time to stop giving everything away. They don’t care about the UN. If Khartoum is confident a compromise on Abiey means suicide for the Republic of Sudan – and this is what I think it is – nothing the UN does will make any difference. When you are busy saving your house, you aren’t generally too interested in the opinion of your neighbors. Khartoum will work towards preserving Abiey through relocations, introducing total military control, etc. The southerners will either have to go to war, or compromise because all of their oil pipelines pass through the Republic of Sudan and for the time being this is the only way of getting petrodollars. Is Russia planning to develop economic and political ties with the new state? What are the prospects for cooperation in your view? In the event of war between Sudan and South Sudan, development projects can be forgotten. No-strings-attached aid will be the only form of cooperation possible, but I’m not sure how much interest Russia has in that. In general, it’s best to wait and see before making any decisions. On the whole, there are promising avenues of cooperation, such as cell communications, energy, transportation services. A young state may need a lot of things. I also think that Russia will consider a form of diplomatic representation in Juba to receive on-the-spot assessments and recommendations on economic and political cooperation with the Republic of South Sudan. It seems this must be the first step.